Our tradition teaches us that sound is God- Nada Brahma. That is, musical sound and the musical experience are steps to the realisation of the self. We view music as a kind of spiritual discipline that raises one’s inner being to divine peacefulness and bliss. An auspicious coincidence meant that after writing about the teaching of Nada Brahma a few days ago, I heard Ravi Shankar speaking the words above yesterday evening in an archive film. The footage was part of David Murphy's introduction to excerpts from Ravi Shankar's unfinished opera Sukanya. David Murphy was a pupil of Leon Barzin, assistant to Sir Charles Mackerras at the Royal Opera House, Covent Garden and English National Opera, and a longtime collaborator with Ravi Shankar. His technical credentials in both Eastern and Western music may be impeccable, but David Murphy's involvement with Eastern traditions has stll earned him the sobriquet of the 'yogic conductor'. In 2010 David Murphy conducted the premiere of Ravi Shankar's Symphony with the London Philharmonic Orchestra. The collaboration between composer and conductor developed from the Symphony into the realisation of Ravi Shankar's vision for an opera that would unite Eastern and Western musical traditions while also communicating the Indian spirituality that was so important to him. At the time of his death aged 92, Shankar had sketched the melodic shape of the whole opera, and knowing that his time was limited, left instructions for its completions. David Murphy is working on the completion, together with the librettist Amit Chaudhuri, and the pandit's daughter Anoushka Shankar and wife Sukanya Shankar. As well as being the name of the composer's wife, Sukanya is a heroine in the Mahabharata, and Amit Chaudhuri's libretto is based on a story from the Sanskrit epic poem. Among the organisations backing the completion and staging of Sukanya are the Royal Opera House, Covent Garden, 59 Productions, who contributed to the multi-media sequence for the opening of the 2012 London Olympics, and the Bagri Foundation, a charity that supports Asian cultures. Two leading provincial arts venues are also backing the project, Norwich Arts Centre where last night's pre-premiere performance took place, and the Curve Theatre in Leicester where the performance is repeated on 1st October. At this point I have to confess I approached Ravi Shankar's embryonic opera with some trepidation. Readers will know I have huge admiration for Shankar's work with Indian classical music. But I find his Western-style compositions, the three Sitar Concertos and Symphony, less successful. In these, limited Indian forces - the Symphony also uses a sitar - are forced somewhat uncomfortably into dialogue with a Western orchestra. Ravi Shankar seemed to struggle with the Western concept of thematic development and resolution, which contrast strongly with the Eastern concept of non-linear exposition of which he was a master. As a result, the thematic development in his orchestral works sometimes verges on cliché. Also adding to the trepidation was my increasing disaffection with East/West musical fusions, which all too often end up as global muzak. But it is great to be proved wrong, and proved wrong I certainly was yesterday evening. 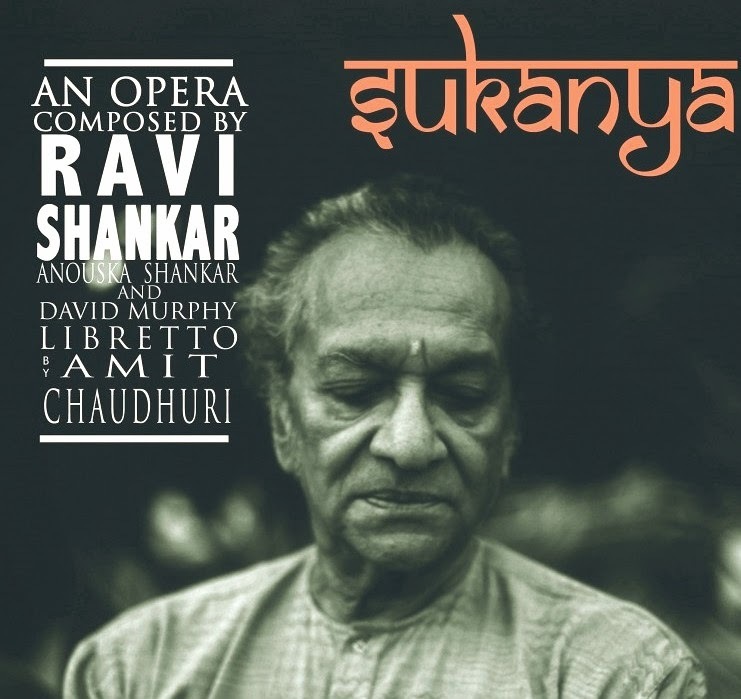 Sukanya is, in accordance with Ravi Shankar's direction, being prepared in two performing versions; an opera house version with a Mozart sized orchestra, and the chamber/touring version that was pre-premiered at the Norwich Arts Centre. In last night's performance in the intimate acoustic of a deconsecrated church, a core of four Indian instrumentalists - sitar, shehnai (Indian oboe) tabla and ghatam (clay percussion) - was paired with nine Western string and woodwind players, with the vocal parts being taken by soprano Susanna Hurrell as Sukanya and tenor Amar Muchhala as Chyavana. The result is a genuine dialogue between East and West, rather than the shouting match that occurs when small Indian forces are matched against a full-sized Western orchestra. In fact I would go as far to say that, judging by the preview last night, Sukanya is not an East-West opera as billed, but an Eastern opera that uses sparing Western forces to justify its categorisation. In fairness credit must go to David Murphy as well as Ravi Shankar. Someone who prepared Mozart under Mackerras is going to be very experienced in balancing the voices - instrumental as well as vocal - in opera, and that experience certainly shows in Sukanya. A video sampler of a preview at the Linbury Theatre of the Royal Opera House, Covent Garden can be seen here. Ironically, when I wrote that sound is God a few days ago, I also said that "It may be my age, but those moments when a piece of music really hits me in the solar plexus seem to get rarer and rarer". I went to the preview of Sukanya with trepidation; but not only was I surprised by what I heard, I was also surprisingly moved. Completing the opera as a performing edition is a long term project. The Royal Opera House has made a shrewd decision to back David Murphy and his collaborators. Sukanya, with its trans-cultural pedigree and message that there is life beyond Western materialism, may be just the opera to show that Anna Nicole is not the only way to attract new audiences. My ticket for Sukanya was bought at the Norwich Arts Centre box office. Any copyrighted material is included as "fair use", for the purpose of critical analysis only, and will be removed at the request of copyright owner(s). Also on Facebook and Twitter.